Bangkok is amazing, but even the most ardent city-slickers will find it nice to get out of the city sometimes. You can choose to travel with a Thai tour operator, but it is sometimes also good to travel independently because it allows spontaneity and a better insight into Thailand and its culture. An organized tour may be more time and cost efficient, though – and very entertaining when you have a good guide. Thailand is very safe and people are very friendly, helpful and tolerant towards gay and lesbian couples. A gay or lesbian couple holding hands won’t be given a second look. However you should always respect the culture, which generally disapproves of overtly public displays of affection (be you gay or straight). There’s not a more satisfying way to travel Thailand than by train: the rhythmic clicks and clacks, the sights, sounds and smells of the towns you pass through. With a significant other, count on romance in the air. With great excitement and expectation, we boarded the 9:30am train from Hualamphong Station in Bangkok, handsome potential boyfriend in tow. For the next 2 hours, we enjoyed views of lush green rice paddies, Thai rural life and lots of water. It was October, the height of rainy season, and many of the fields were flooded. It felt as if the train was skimming across water. 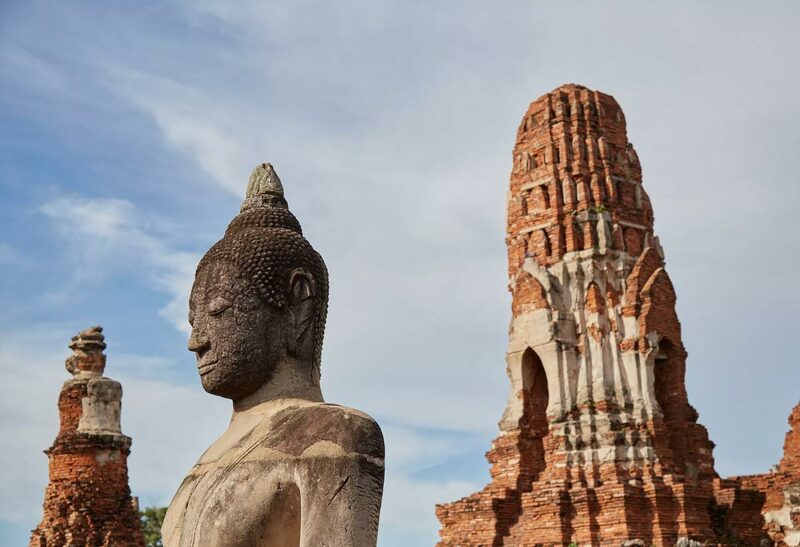 In Ayutthaya, the ancient capital of Thailand and a UNESCO World Heritage site, we checked into our hotel and picked up two bicycles to see Ayutthaya’s ruins of ancient Wats (Thai Buddhist temples) and palaces. As we cycled amongst the ancient sites, there was electricity in the air. Literally. A bolt of lightning exploded close by and the heavens opened. We sheltered in an ancient palace – almost too romantic – until we had our first minor disagreement of the relationship (we finally agreed that our kingdom would be ruled by two queens). The rains passed, and we finished the day with a refreshing swim overlooking one of the majestic ruins with the sun setting behind. Magical. Next morning, a driver (arranged by the hotel) picked us up and we headed to the less visited province of Suphanburi, 75km from Ayutthaya in Kanchanaburi Province. Primary reason: tiger and lion cubs! Now, I’m sure everyone has an opinion as to the rights and wrongs of wild animals being kept and bred in captivity. All I can say is, spend 30 minutes in an enclosure full of lion and tiger cubs, and tell me how you feel afterwards. After frolicking with loving cubs, we drove on to Erawan National Park and Falls. Through a forest of the greenest greens, we hiked the many-level waterfalls that pour into emerald and turquoise pools. We’d worked up a sweat in the tropical heat, so we took a dip in one of the more alluring of the pools. Exhilaration. I began to feel a tickling on the backs of my legs. Hmm, perhaps my man was getting a little frisky? I looked down to see a school of small fish nibbling away. I’m not sure how to describe my feelings, shock, disgust, pleasure? It was intense, and I actually recommend you try. On the return trip to Bangkok, we came to the highlight of an already supreme trip. At the Taweechai Elephant Camp, we rode through the jungle on gentle giants, and then cooled off with them in the waters of the River Kwai. I haven’t laughed so hard or been so touched. Elephants are tender and intelligent beasts, and no trip to Thailand should forgo spending time with these magnificent creatures. Newer Post The art of eight limbs	Older Post Let’s go to Pattaya!